Read in the latest Journal the proposed list of 31 issues. Disappointing but not surprising Atlas is warming over the French issues with only a handful of new castings of English Dinkys namely Mini, Bedford Van, Morris J Van, Jaguar XK120, Zephyr, Atlantic, Oxford. Not sure how they can justify French Dinky models for the UK, as only a few were marketed and available here: Thunderbird, Panhard 24c, Renault 4L (correct me if I'm wrong ) with twelve others listed eg Kapitan which were in the UK range in some shape of form. With the doubling up of issues on the vans that's still 7 entirely French models and bad luck for anyone who has been collecting the French Atlas ones (like regrets I have a few, but then again too few to mention....). A number of English Dinky have already been issued in the French range : 105 TR2, 181 VW 1200, 182 Porsche, 174 Volvo 122 and 191 Dodge Royal. This must have been a test of some sort but not explained to the customers. These models will of course be re-issued in the English range except the Dodge for which Chrysler will not issue a licence. 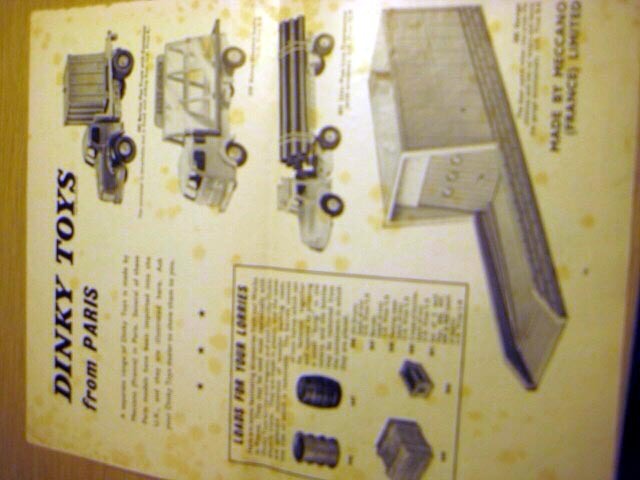 The Thunderbird, Panhard 24c, Renault 4L etc... must have been imported in Emgland a some stage, check in the Great Book of Dinky Toys where the imported models are listed. You must also check the source for your list. Atlas does not usualy publish the future models although you can expect that most cars without opening parts will be issued except Chryslers and Ferraris due to licence problems. There may also be a couple of special models a year which will not be included in the range and which will be available on mail order in limited quantities. You may find that there may be some variations or improvements between the models that you have bought from the French range and those that will be issued in U.K. 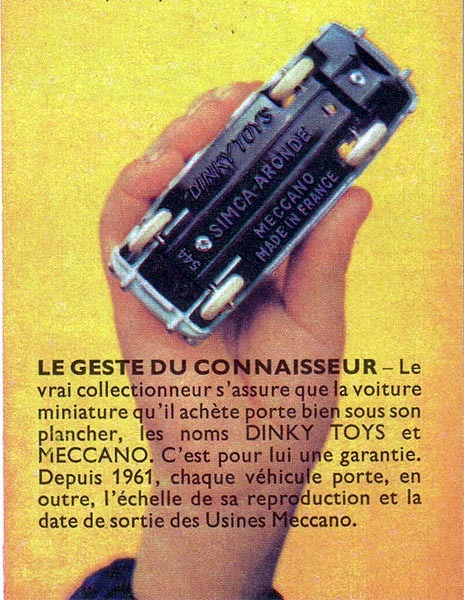 I attach copies of 3 pages from an old Meccano Magazine showing the range of French Dinkys which were marketed in that UK. Glad to hear the Dodge may not be repeated due to Chrysler licence issues but that also means no blue/white Plymouth Plaza which I would like to have seen issued. Here is a list of models which are very likely to be issued in the English range of Atlas models. 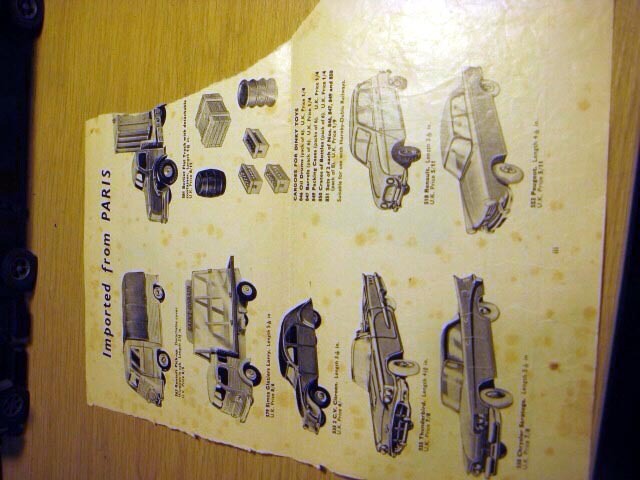 All these models have been imported to England and have been tooled for the French range. 14z Three wheel delivery van. 23d Auto-Union. Which variation ? 35az Fiat two seater saloon (Simca 5). 39f Studebaker State Commander. The 24y / 540 Studebaker Commander has not been imported to U.K. I notice that quite a few of these are turning up on Ebay now,a few being only listed as "Dinky Toys mint in box", with no mention that it's a new model. Naughty that. I'm buying a few of each as they come along to see how they go at the Toyfairs. They are very good models I must say, just hope that no one gets taken in thinking they are originals. The Atlas models are clearly stamped Editions Atlas Made in China so if some one mistakes one for an original, he must go back to school to learn reading. As far as special finishes are concerned, there will probably be as many as in the French collection. You can expect the South African colours and those of colour samples and the rare variations like the Taunus POLIZEI. They may be ex range to increase the amount of models issued. And always remember "Le geste du connaisseur" to check that the model is marked DINKY TOYS AND MECCANO. The problem is that those I've seen on Ebay are very careful NOT to show the base. The old favourite slightly out of focus picture is used too, with the caveat "as seen in picture". I don't think anybody here, or who knows a bit about Dinky's would be fooled, but a new collector might, that was my concern. I find I am buying less and less on E-bay as there are far too many deceitful sellers now. I have not been caught out and don't want the hassle. The problem is the number of sellers is declining and E-bay do not give a damn as long as they are getting their fees. They used to protect both buyers and sellers but now don't care. I only buy now from sellers I know. This is a shame for the innocent newbies but both E-bay and Paypal need to stand up and be counted. eBay / PayPal is a roten company always at the limit of legality. Several actions have been taken and won against them so they had to withdraw several of their rules. The sellaer has no protection at all the buyer has all the rights. Sellers can not even post a negative feedback against a bad buyer. Also now one can not see what is for sale in other countries. One has to subscribe to eBay in each country with various rules such as mandatory PayPal. eBay is loosing business everyday but unfortunately there is no competitor. I have bought and sold things on eBay worldwide from Tokyo to Timbuctoo, with only 3 resolved problems in over 1000 transactions. I know many do not like eBay or PayPal, but I also have had very good experiences in buying probably close to 200 Dinky's in the past decade. Since I live in Southern California, and there are few to none toy sales or shops, I would not have anything close to the collection I have today if it weren't for eBay. But I also agree it is not the same as years ago, mainly in that many fewer really good sellers are there now. To me, it appears that about 90% or more of what I see is either code 3, decent to poor re-paints, outright junk, or stuff like the Atlas models. 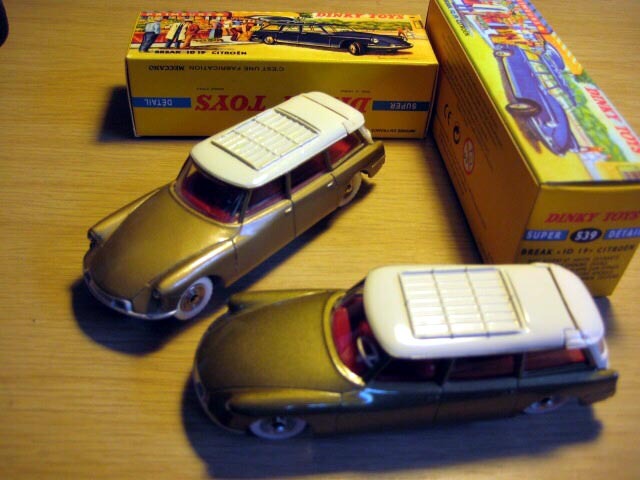 Very few very nice to mint original models from the Golden Era to choose from. For those of you who live on the Continent, it is a very different story, so it is much easier to not use eBay. I have some Atlas Dinky for sale. Is any one interested ? On the Atlas versus the real thing, I think we all know what we would prefer, but money is obviously a limitation and if it gives one the opportunity to fill a gap in the collection or collect something otherwise unaffordable, or even which one might not buy at all except at these low prices then fine. On confusing the real thing hopefully DTCA members are pretty canny, but I did question the claims in some quarters that they were exact copies. My letter in MC Oct 2011 examined the DS and the Borgward, the latter having too high a glass house by comparison (the casting being used I believe by Atlas in another of their ranges but having been Dinkyfied, and also by another budget model company Auto Classics). There was a similar issue with the Corgi 50th Ford Consul, where the new casting was very different in size and weight despite being a supposed 'replica'. 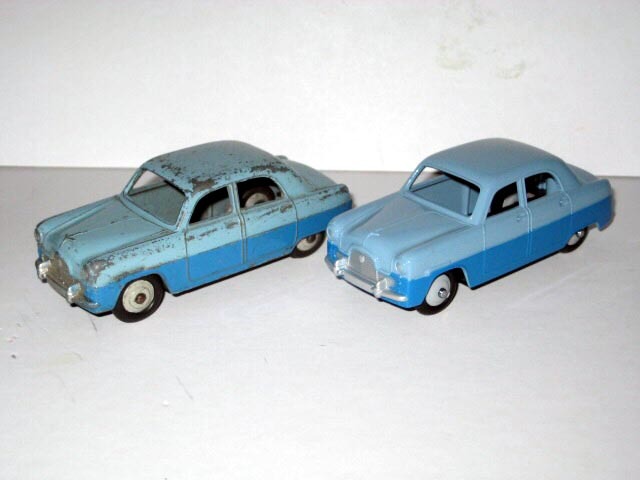 Overall I like these complementary models, having some Dan-Toys , some Club Dinky de France (made in the UK of course), and some nice Atlas (eg Panhard Esso). 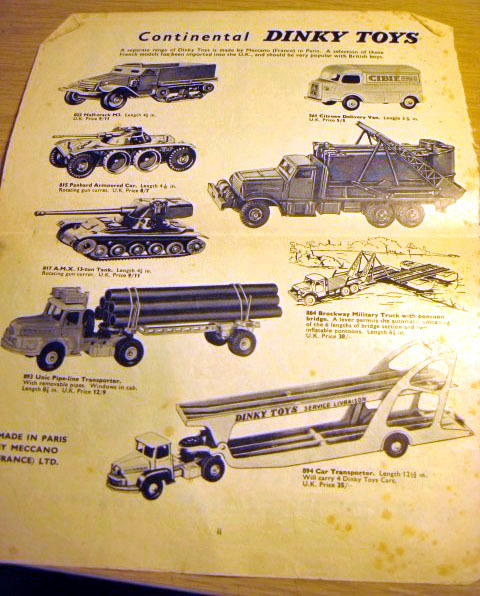 I have no problem with Atlas "Dinky Toys" as it may encourage new people into the collecting arena as they are aggressive with their publicity. However, I would not buy an Atlas personally. Where I do have a problem is with unscrupulous people attempting to pass them off as the real thing, I have seen a lot of this. It would not work with members of the DTCA because they know what they are buying. I wonder how many new and innocent buyers have been caught out by this. I am buying the lovely models made by Ruby Toys as these are different to anything Dinky made but are an absolute delight to look at. 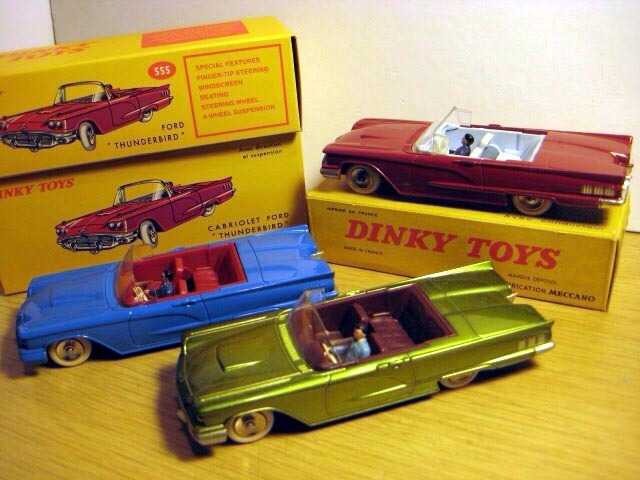 Furthermore, it is not possible to pass them of as Dinky Toys. Are these 1/48 or larger? I like the Albion, having never seen one on the road, but in the Haynes Museum. Atlas Dinky toys are very apealing to the eye and I also have some. But as mentioned by someone here there are some people the are very unscrupulous. I have been tricked on eBAY the other day. A merchant posted a picture of an original South African Dinky with its box in Afrikaans as well. I won the auction and waited for my Dinky to arrive. Unfortunately when it came it was a Atlas Dinky and also in the wrong colour. I can say that I was not pleased in the least sence. Again there was no picture of the base, although the seller was asked by other if it was the real thing. I immediately contacted eBAY, but was told that I have to take it up with PAY PAL. Please also see the attachment for a photo of the article in question. I must say that the Atlas Dinky's really apeal to the younger collectors. My son on 16 is always very enthusiastic when I get a new model. So the ATLAS collection is his to get, with a gift from dad so often. My opinion is that is a very good starter to end up with the real thing later. I have been trying to reply to your e-mail about my book but the e-mail keeps bouncing straight back. Can you please e-mail me directly on earlsroad7@hotmail.com and I will then have your correct e-mail address. The Atlas UK issues are now trickling through. I attach a photo showing the UK issue of the Thunderbird (blue), with the French issue (green), and the original. Atlas have been good enough to issue two box types being an enlarged replica of the French box, and now an export box in English/ German. I think they also issued the French Atlas issue in white. I understand forthcoming May issue of Model Collector, out April 1st, will include an interview with Atlas Editions manager which could be interesting. A maroon 197 has appeared, which seems a bit daft as the green one was the first issue and who wants two? A 199 at a pinch. Also VW Swiss post has appeared. Can't see Corgi going for it, what would be in it for them? Haven't they got the original dies anyway? So they could do their own range of re-issues if they wanted? Matchbox I doubt too, can't see it working, they tried re-issuing some old castings as Matchbox Originals years ago didn't they? Latest Zephyr received. The glass house looks undersized, and the Atlas is fractionally shorter. Here are more latest Atlas UK Issues, number 10 Austin Atlantic and 11 Citroen ID19 Break. As I have only received 9 so far I queried this with Atlas to be told, you will get them when they are in stock and that I should disregard the numbering, so I hope that I will get the PTT VW I believe due and the streamlined car at some point. The Austin looks quite good, but as a former Citroeniste the ID gets some criticism. The DS always had a shark look and front higher than the rear (courtesy of a nice hydraulic lever by the driver) captured by Dinky by a 15% difference. Atlas have made the car level and also given the front wings a droop so the headlights look down at an angle not forward. This same droopy wing and level stance can be found on Altaya IDs, so maybe out of the same Chinese factory drawing office. Dinky headlights point forward, hatch has a matt finish and the body is metallic gold. Atlas have made the body more bronze and the paint is not consistent in colour having a sort of granular appearance. Where Atlas have excelled is in reproducing the small tread white tyres (I have had a devil of a job trying to get replacements for my Dinky, if anyone knows where). My Dinky has a black steering wheel as does my Ambulance 556, and Atlas have a white one; Les Dinky Toys by Jean-Michel Roulet shows both the red interior and white interior versions with white steering wheels. Was this ID ever a UK issue? As Atlas is no longer a verboten term in the DCTA comments please. The Austin Atlantic - wasn't Art Deco a bit dated by then ? 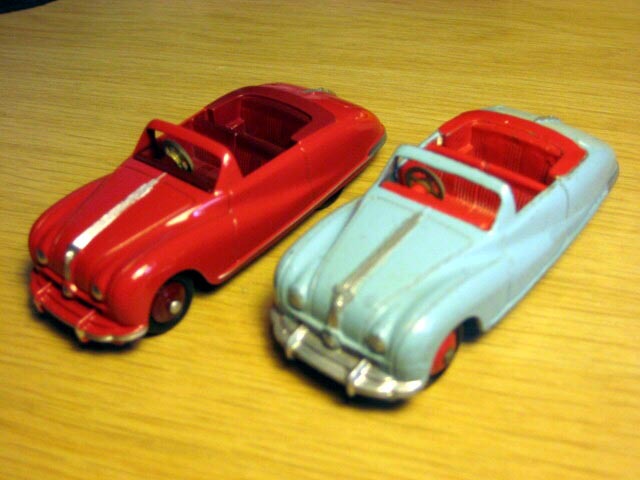 Austin Atlantic - Atlas have painted a fine chrome line along the cills, just body colour in the Dinky.